This page provides you with Video Editor resume samples that you can use for inspiration in writing your own resume, or for creating one through our easy-to-use resume builder. Below you'll find our how-to section that will guide you through each section of a Video editor resume. Dear video editor, we have great news and bad news for you. Let’s start with the bad news: your field is one of the most competitive of the last decade. Great news: lots of companies now require your services and, if you were looking for inspiration for the best video editor resume sample, you have reached your destination, Captain! 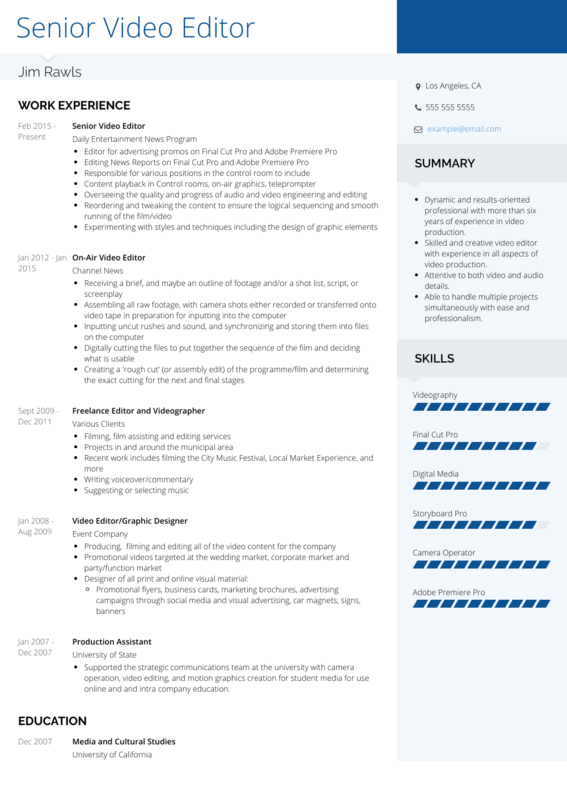 The first step to getting that dream job as a video editor is going to be through the creation of an excellent resume that will stand out among your competition. As interesting as video editing is, your resume needs to be of a fantastic quality. No recruiter would actually believe in your skills if you are unable to show them your competence. You may think that this is quite difficult but VisualCV is here to make the whole process simpler! We have helped thousands of video editors like you secure their dream jobs by helping with their resume. Let us inspire you, we want to take your career to the next level! How to Write a Video Editor Resume? Usually, video editors have knowledge and skill in computer literacy, pre and post-production editing, film and art studies. Experience is crucial and it’s something which most editors have (on some level), but unfortunately, it’s a competitive business and essentially your resume must grab the attention of the employer. In our many years of experience, we have helped video editors throughout the recruiting process and we want you to be the next. Firstly, you must opt for a professional tone and ensure the layout and format is easy to read and understand. The reverse-chronological layout not only highlights your strengths and skills but also makes the achievements you’ve gained standout. When creating the resume you must use headings and fonts which are legible and clear for readers. It’s easy to use a font which is hard to read because it looks better but it’s not always the best font. You also want to have lots of white space. It absolutely helps employers read the resume and make it a more enjoyable. A clean and tidy resume is one which stands out. Lastly, don’t forget your attention to detail is crucial, not to mention accuracy in the information you provide to the employer as well. Accuracy and attention to detail truly are two crucial fundamental skills each and every employer looks for and expect from a professional like you. Try to avoid mistakes in your resume, especially typos. Oh, and PDFs please: Microsoft Word is so 1995! This section of the resume is your initial pitch to get the attention of the recruiter. In less than 30 seconds, the quality of this paragraph will determine whether you deserve a second look or not. Don’t fret; we are here to help you! Actually, this section answers one of the easiest, yet most complicated interview questions: Tell me about yourself. DO (Summarize your employment) - List responsibilities which match the position you’re applying for. - Try to be specific about your talents or skills which make you a star candidate. - Highlight why you’re the perfect fit for the position. - List relevant achievements employers will appreciate. - Talk about your two most recent work experiences. DON’T (Summarize your life) - Don’t be generic. - Don’t fill your resume with technical terms or jargon. - Do not oversell yourself & do not sell yourself short either. Congratulations! If a recruiter makes it to this part of your resume it’s a fantastic achievement. However, if you are now starting to think that you don’t have the work experience needed to get the job, please don’t worry! In truth, a lot of people don’t have experience but there are simple ways to change that. For example, you can freelance your skills out and gain some much needed experience. Even, small side jobs can absolutely help improve your resume and bring work history or experience to the table. The one thing you should never do on a resume however is lie about your work experience because sooner or later, you’ll get found out. Instead, try to gain experience in a variety of ways. We think it’s best to try and list achievements which are important to your career and listing a few major achievements can be useful. So, what makes a big achievement? Well, it could be anything from an internship you were awarded to your first job as a video editor or quite simply a degree in post-production editing. You’ll have achieved something so have a good think! List any internship you’ve undertaken and completed. Highlight any relevant achievement within this field. Include any and all awards from previous jobs. DON’Ts (Summarize your relationship history) - List four or more previous work experiences. - Start listing all responsibilities you’ve had in previous jobs. - List achievements relevant to the job you’re applying to. - Include internships you didn’t finish or aren’t related to the job at hand. Need more tips on writing an efficient work experience section for a video editor? Check out our detailed resume guide ! It doesn’t matter whether you’ve been a video editor for five years or five months, your education matters. The type of education you have gone through will mean a lot to the employer because it tells them about you as a person. Once you’ve listed the above, you want to go onto highlighting your achievements from college and any relevant work experience you have, if any. If you have very little work experience, don’t panic just yet, everyone has to start somewhere. However, try to add information which is relevant to the employer and the job you’re applying for. What is more, putting any job (even unpaid) that relates to video editing will draw the attention of the employer. Video editors are screened differently nowadays. The skills you can display now represent a very big part of your personality and can disqualify you from a position. If you are interested in showing a good amount of relevance, you need to possess the skills required by these recruiters. These skills are quite common to the top video editors and they are what imbibing. There is no problem if you don’t know the specific skills to possess. We will provide you with that information. You need to know that your resume needs to have a list of professional skills as well as soft skills and hard skills. It is only with these skills that you will be set apart from the rest. This is the list of the skills needed to be a competent video editor. A great cover letter that matches your resume will give you an advantage over other candidates. Follow our tips here. We really want you to get your dream job, and we’ve come up with some additional tips! Well, we are done! You now have access to a standout Video Editor resume sample: if you are also looking for the best Video Editor resume templates, you should check this masterpiece we have been working on here : many professionals like you have successfully used it to take their career to the next level.